Woodlands (Chinese: 兀兰, Tamil: ஊட்லண்ட்ஸ்) is a planning area and residential town located in the North Region of Singapore. The town is connected to Malaysia's southernmost city, Johor Bahru, via the Johor-Singapore Causeway. It is the regional centre for the North Region. Woodlands planning area borders Sembawang to the east, Mandai to the south, Sungei Kadut to the west and Johor Bahru to the north. Woodlands New Town is situated within the Woodlands planning area. The area consisting of modern-day Woodlands Town first witnessed the opening of the Johor-Singapore Causeway in 1923. Early Woodlands consisted of villages and squatters where residents made their living mostly as small-time shopkeepers and vegetable farmers in the Marsiling area, while rubber plantations and poultry farms dot the landscape in Jalan Ulu Sembawang where modern-day Admiralty is located. The first HDB flats were built from 1972 in the northern part of Marsiling, and the Woodlands Bus Interchange located at Woodlands Centre Road was built in 1980. Development of Woodlands began in 1981. This compromises of the building of HDB flats in the Neighbourhood 1, which was completed in 1985; well after the Marsiling Estate. The Neighbourhood 8 were completed in 1987, together with the Neighbourhood 3 in 1989. Because of the saturation of HDB flats, the numbering system added 'A', 'B' and 'C'. Blocks 6xx in Admiralty begun to be completed in 1996, together with the 7xx in 1997. Expansion into Innova began in 1998 and was completed in 2002, which consists of block 5xx. Expansion into the Woodlands East began in 1999 and completed in 2004. The Jalan Ulu Sembawang is a kampong road that cut across parts of the Woodlands New Town and the Sembawang Airbase. Starting from June 1992, the Jalan Ulu Sembawang is being cleared because of the extension of Woodlands New Town, Gambas Avenue, Sembawang Airbase and the Seletar Expressway. The kampong was being cleared by 1996 and it was being converted into a military training ground. 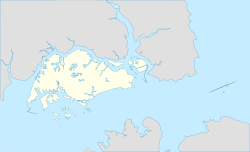 There are three constituencies in the town, and nine neighbourhoods (N1 to N9) within the Woodlands vicinity made up primarily of Woodlands, Marsiling, Woodgrove and Admiralty. Woodlands Square serves as the town centre while adjacent neighbourhood centres also offer a variety of commercial activities. Integrated development plans including Kampung Admiralty are officially launched in April 2014. Of all the estates, Woodgrove is the smallest in size, located towards the northwest end of the town. Woodgrove houses most of the private housing in Woodlands, consisting of high-rise condominiums, and landed properties. Woodgrove lies in between the estates of Marsiling and Woodlands. Marsiling, Woodlands, Woodgrove and Admiralty altogether form Woodlands New Town (not to be confused with Woodlands, Singapore). Woodlands is diverse during the day and well lit at night. Shops, eateries, and commercial zones are evenly spread through the town, with bus and transit routes operating till close to midnight. Divisions within estates are being rapidly modernised and modelled for Singapore's standards; playgrounds, communal gardens, sheltered pavements, multi-level parking lots, barbecue-pits, recreational facilities (such as tennis courts) and trees are found nearly everywhere. With the modernising process outpacing the preservation of its past, Woodlands Town Garden keeps a clear and simple agenda, to bring greenery in the right ambience with the mixture of the local ethnicities. The theme of the park revolves around the Malay and Chinese culture, and winding through the park is Sungei Mandai Kechil, the river that extends into a lake within the park. Woodlands Town Garden is located near to the Woodlands Checkpoint, in the Marsiling estate. To the east of this area, bordering the polytechnic is Admiralty Park, a 27-hectare national park much of which is covered in mangrove. The recent riverine park which opened in phases is the Woodlands Waterfront. It has engaged a lot of residents, especially those staying in northern Singapore. It is also linked to Admiralty Park and a 25 km Northern Explorer Park Connector Network. Woodlands Regional Library, the largest neighbourhood library in Singapore at the time of its launch, is operated by the National Library Board. The four-storey public library caters to all ages and is organised according to themes of general, reference, teens, and children. Causeway Point, one of the largest shopping malls in Singapore, houses 250 shops and various outlets. Woodlands Civic Centre is a designated centre of education, public services, and other forms of assistance for residents. The centre houses the Woodlands Regional Library, several banks, CPF Woodlands Branch, and numerous merchandise and educational institutions. Sports are an emerging emphasis in the Singaporean society. Recreational facilities can be easily located around the estates and especially in parks: The multi-purpose stadium, the Woodlands Stadium, and Woodlands Swimming Complex are common places for sport-goers. Experimental styles of architecture have found their way into Woodlands, making the town a place of wonder and color, with much integration with recreation. From the early practical designs to its modern-day luxurious manifestation, housing apartment blocks are no longer as plain as they sound; with the garnish of parks, communal gardens and décors, these blocks are pieces of art and style themselves. The centrepiece of the town, Woodlands Square, attracts a constant flow of travellers and shoppers daily. Tireless planning and redevelopment keeps the town modernised. Singapore's first sports school, Singapore Sports School, is an independent boarding school with some of the finest sports facilities. Singapore's fifth polytechnic, Republic Polytechnic, is situated in the north of Woodlands. Innova Junior College, a new junior college in Singapore, is situated at the south of Woodlands. In addition, there is also an international school, Singapore American School. Woodlands has 7 churches and 2 mosques and 1 temple. Being located immediately across from Johor Bahru across the Straits of Johor, Woodlands is highly accessible, connected by major roads and expressways, with a relatively large bus interchange, the Woodlands Temporary Bus Interchange, and an elevated train station next to Causeway Point at Woodlands Square. Most of the bus routes are operated by SMRT Buses, while SMRT Trains operates the train stations. Residents of Woodlands are currently serviced by three Mass Rapid Transit (MRT) stations: Woodlands MRT Station in the centre, Marsiling MRT Station to the west, and Admiralty MRT Station to the east. The Woodlands Temporary Bus Interchange has been relocated from the previous Woodlands Town Centre to the current town centre at Woodlands Square, and temporarily relocated to outside Woodlands Square. Access to Woodlands will be made easier with the introduction of the 43-km long Thomson-East Coast MRT Line from 2019 onwards, which will create 2 additional stations in Woodlands, namely Woodlands North and Woodlands South. Both of these stations are adjacent to the existing Woodlands station on the North South Line. All three stations will be completed by 2019 and open as the first phase of the new line. This will facilitate more convenient transportation within Woodlands itself. A future rapid transit link, the Johor Bahru–Singapore Rapid Transit System, will have its Singapore terminus at Woodlands North, improving access between Johor Bahru and Singapore. Land transportation in Woodlands is relatively efficient, in comparison to other estates, contrasting by the amount of well-maintained roads, though a common sight in Singapore. Twelve avenues support and help circulate all of the traffic of the town, especially the notable ones, such as Avenue 2, Avenue 3 and Avenue 7, which come from the expressways. Woodlands Avenue 2 is a shorter route from the older estates of the town to the Seletar Expressway. To connect the Woodlands Avenue 2 into the Seletar Expressway, part of the road was being built since 1998. SBS Services 161 and 168 plies along the shorter route of Woodlands Avenue 2. Woodlands Avenue 3 connects Marsiling from the exit of Bukit Timah Expressway to Woodlands Centre Road, which leads to Woodlands Checkpoint. The rest of it maintains a similar route of the MRT line, which connects to Woodlands Square. As the avenue ends at the entrance of the slope of Woodlands Square (the road that circulates Woodlands Square), another end starts at Woodlands Avenue 7, which connects Woodlands to Admiralty, also along the route of the MRT line, ending at Gambas Avenue. Divisions within estates are further connected and regulated by two- or single lane roads called streets, which are distinguished by a suffix of double-digit numbers, such as Woodlands Street 82 and Woodlands Street 83. This was a common practice before the late '90s. Drives are two- or single lane roads built for newer divisions within an estate, similar to that of the streets. Links and Crescents are often three-, two-, or single lane roads that convey commuters from a main road to another main road, such as the Woodlands Link, which connects Woodlands Avenue 9 to the main roads in the Woodlands Industrial Park. Crescents connect main roads to streets or drives. Wikimedia Commons has media related to Singapore#Woodlands. ^ a b "Land Area and Dwelling Units by Town". Data Singapore. 2016. Retrieved 26 January 2018. ^ "Statistics Singapore - Geographic Distribution - 2018 Latest Data". Retrieved 11 February 2019. ^ Jalelah Abu Baker (7 June 2013). "This used to be my playground". The Straits Times. p. B14, Home section. Retrieved 11 January 2015. ^ "Integrated Development In Woodlands, "Kampung Admiralty", Takes Off With Groundbreaking Ceremony". Housing & Development Board. Retrieved 19 August 2014. ^ "THE WOODGROVE". Singapore Expats. Retrieved 19 August 2014. ^ "Netizens 'stalk' handsome police officer who saved cat from tree". Stomp. 16 January 2015. Retrieved 15 January 2015. ^ "Singapore National Parks Visitor Guides – Admiralty Park". Retrieved 2 February 2009. ^ XUAN, LEE JIAN. "Two new mosques to be built in Jurong west and Woodlands by 2016". Retrieved 4 October 2015. ^ "Thomson Line Media briefing" (PDF). LTA. Retrieved 5 October 2015. ^ "North Region". Urban Redevelopment Authority. Retrieved 29 June 2016. This page was last edited on 11 March 2019, at 23:32 (UTC).